Celebrating the life of Marvin Albert Cotney, Jr.
Be the first to share your favorite memory, photo or story of Marvin. This memorial page is dedicated for family, friends and future generations to celebrate the life of their loved one. 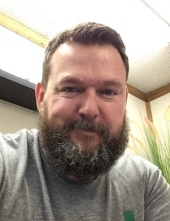 Obituary for Marvin Albert Cotney, Jr.
Marvin Albert Cotney, Jr. 48, passed away on Thursday, February 7, 2019 in Stillwater, Oklahoma. Memorial service will be held on Tuesday, February 12, 2019 at 2:00pm at Zion Lutheran Church in Stillwater. Dighton Marler Funeral Home is in charge of arrangements. Marvin was born on August 16, 1970 in Oklahoma City to Marvin Albert Cotney Sr. and Morris Ann (Glocke) Cotney. He grew up in Oklahoma City and Choctaw and graduated from Choctaw High School. Marvin was an Entrepreneur; he was a kind, caring man. He enjoyed nature, photography and swimming. He owned a CBD store in Stillwater for the last six months. He married Sherry Lindon on January 23, 2019 in Stillwater. Marvin is preceded in death by his father, his maternal and paternal grandparents. He is survived by his wife Sherry, his children Adrian Cotney, Hope Cotney, Courtney Ramsey, Katie Klingaman, Jesse Cotney and wife Tamera and Tyler Cotney and wife Rhendi, his sisters Deborah Cotney and Carrie Hansen and husband Mike as well as two grandchildren, Anden Cotney and Aurora Cotney and one grandchild on the way. Condolences may be sent to the family via an online guestbook at www.dightonmarler.com. Family request monitary donations be made directly to funeral home to help with funeral expenses. To send flowers or a remembrance gift to the family of Marvin Albert Cotney, Jr., please visit our Tribute Store. "Email Address" would like to share the life celebration of Marvin Albert Cotney, Jr.. Click on the "link" to go to share a favorite memory or leave a condolence message for the family.